The UCI is pleased to present its 2018 Annual Report. The publication looks back at highlights from one of the UCI’s most eventful years to date, including the launch of Monmouth University’s newest and largest research vessel, the Heidi Lynn Sculthorpe; innovative student-faculty research projects; work with the State of New Jersey to begin the development of a comprehensive coastal resilience plan; a partnership to protect Monmouth County coastal lakes; and much more. Visit our report page to browse its pages in a digital flipbook format or download a PDF version. Click here to read a press release with the full poll results. 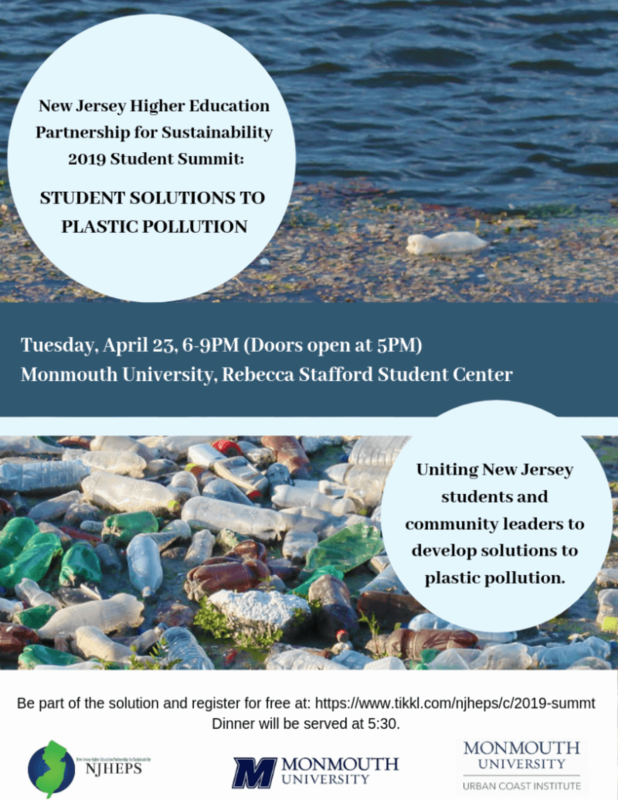 The New Jersey Higher Education Partnership for Sustainability (NJHEPS) will hold its 2019 Annual Student Summit at Monmouth University on April 23. The event will run from 6-9 p.m. at the Rebecca Stafford Student Center and focus on solutions to plastic pollution. The summit will start with motivational talks from representatives of Clean Water Action, Surfrider Foundation and Clean Ocean Action on their efforts and successes in reducing plastic pollution. Tables of attendees will then discuss and report on what changes can be implemented by students and administrators on college campuses to reduce plastic usage, putting alternatives in place and setting a positive example for surrounding communities, and in support of the state’s pending plastic bag ban. This event is free and open to the public, but participants must register in advance. To register, visit https://www.tikkl.com/njheps/c/2019-summt. The Mid-Atlantic Committee on the Ocean (MACO), a consortium of state and federal agencies, fishery management officials and tribal entities, convened its inaugural forum at Monmouth University on March 20. 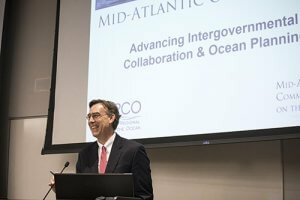 The Mid-Atlantic Ocean Forum was the first of what is expected to be an annual series of events that provide industry experts, government officials and members of the public an opportunity to collaborate and exchange information on marine science and policy issues. The New Jersey Department of Environmental Protection’s Liz Semple, chair of the Mid-Atlantic Regional Council on the Ocean (MARCO), welcomed the nearly 200 attendees to the forum. The UCI assisted with the event’s organization and facilitation. UCI Director Tony MacDonald emceed the proceedings, while Associate Director Tom Herrington and Communications Director Karl Vilacoba led panel discussions on the topics of offshore sand/sediment resources and regional ocean data priorities, respectively. Vilacoba, who serves as project manager and communications lead for the Mid-Atlantic Ocean Data Portal development team, offered a preview of the data products and tool upgrades planned for 2019. Among the many items highlighted were new maps depicting party/charter boat fishing hot spots in the region, fish and marine mammal distributions, potential sand resource sites and the most current offshore wind planning areas. He also unveiled a new tool that allows users to animate map layers showing the same data types at different time intervals, demonstrating with monthly maps of vessel traffic patterns in the Mid-Atlantic. Deerin Babb-Brott, the White House Office of Science and Technology Policy’s principal assistant director for oceans and environment, provided an update on the implementation of President Trump’s 2018 executive order on ocean policy. He said that one of its key directives was for federal agencies to work with regional entities throughout the country to compile a list of their top ocean data needs and identify federal resources that could help fulfill them. 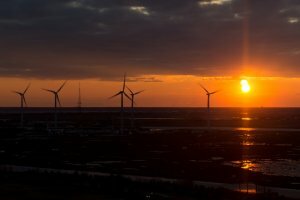 Babb-Brott said the administration is committed to providing funding for portal projects and regional ocean partnerships like those in the Mid-Atlantic and Northeast. Participants could choose to join any of six break-out sessions focused on the topics of ocean acidification, recreational/non-consumptive ocean use, healthy ocean indicators, marine debris, maritime commerce and navigation, and science and research priorities. The takeaways from each session were recorded and presented to the full group of forum attendees during a wrap-up discussion that concluded the event. To view an agenda from the meeting and learn more about regional ocean planning, visit the MARCO website at midatlanticocean.org. Videos of the forum discussions will be available on the website soon. View our album of photos from the event. Leading experts from around the world in the areas of climate change adaptation law and science will assemble at Monmouth University on April 17-18 for the Climate Change, Coasts & Communities Symposium. With the “new normal” of increased storm events, flooding, sea level rise and coastal erosion being caused by climate change, the event will focus on lessons from other states and abroad that can help New Jersey navigate the challenges. Discussion topics will include climate change impacts to voiceless communities, including future generations, wildlife and natural resources; the public health dimensions of coastal adaptation; and scientific strategies to combat climate change-induced factors that are harming marine and coastal ecosystems. Keynote speakers include Global Ocean Forum President Biliana Cicin-Sain, University of Tasmania Faculty of Law Professor Jan McDonald and University of Utah S.J. Quinney College of Law Professor Robin Craig. The two-day symposium will kick off with a panel of Monmouth University students presenting their research on issues including the transfer of development rights and easements to improve coastal resilience and the threats extreme weather events pose to drinking water supplies. For registration and more information, visit monmouth.edu/climate-coasts-communities or contact Professor Randall Abate at rabate@monmouth.edu. The event is free for Monmouth University students and employees (registration required), $35 for members of the public and $25 for Monmouth alumni and non-Monmouth students. The admission cost covers an opening night reception, Thursday continental breakfast and lunch, and refreshments. The event is being hosted by Monmouth University’s Urban Coast Institute, Wayne D. McMurray School of Humanities and Social Sciences, School of Science, Office of the Provost, Global Education Office, Department of Political Science and Sociology, and Youth Activists Group. 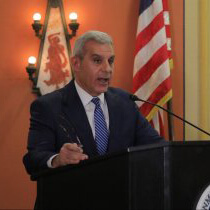 Former state Sen. Joseph M. Kyrillos will moderate “Our Ocean and Beaches: A Record of Success and New Challenges to Face,” on Friday, April 5 at 10 a.m. in the University’s Wilson Auditorium. 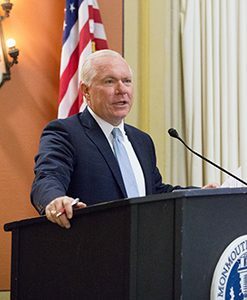 This is the fourth and final panel discussion he will lead as the 2018-2019 Monmouth University Public Servant-in-Residence. Previous panel discussions in the public servant-in-residence series focused on pension and benefit reform, bridging the partisan divide, and jobs and the economy. The panel will feature environmental experts including: Cindy Zipf, executive director of the nonprofit Clean Ocean Action; Chris Daggett, former regional administrator of the United States Environmental Protection Agency and commissioner of the New Jersey Department of Environmental Protection; and Tony MacDonald, director of the Monmouth University Urban Coast Institute. Online registration and further information are available. 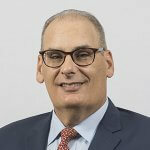 Professor Randall S. Abate (Department of Political Science and Sociology and Rechnitz Family/Urban Coast Institute Endowed Chair in Marine and Environmental Law and Policy) delivered a lecture on his book, Climate Change and the Voiceless: Protecting Future Generations, Wildlife, and Natural Resources (Cambridge University Press, forthcoming August 2019), to students at the University of Miami School of Law on March 19. The book talk was co-sponsored by the law school’s Environmental Law Society and Student Animal Legal Defense Fund. 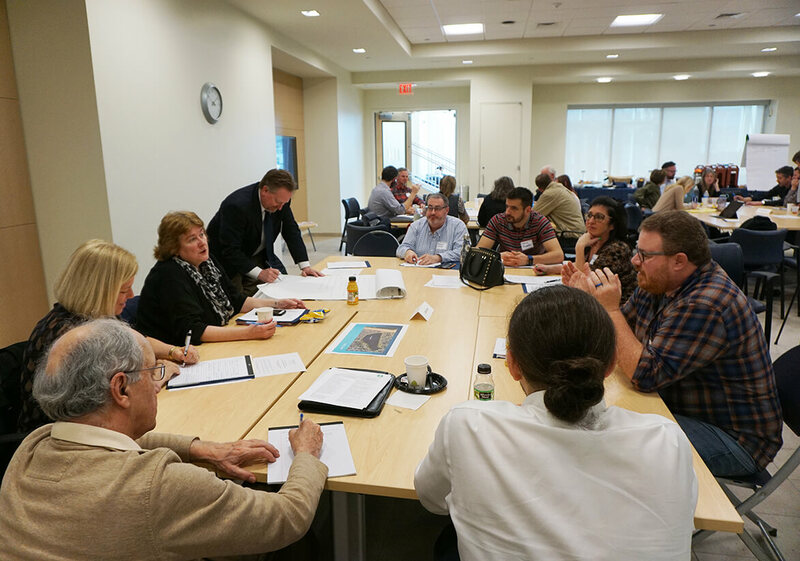 Monmouth University kicked off a citizen science partnership with community groups, residents and municipal officials on March 15 to probe the causes of environmental problems impacting six Monmouth County coastal lakes. 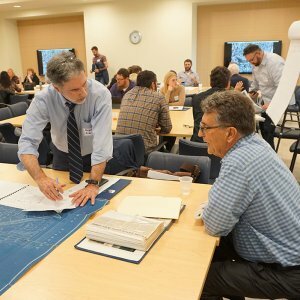 Over 100 representatives of the communities surrounding Deal Lake, Lake Como, Sunset Lake, Sylvan Lake, Takanessee Lake and Wesley Lake gathered at the Edison Science Building to lay the groundwork for a new Coastal Lakes Observing Network (CLONet). 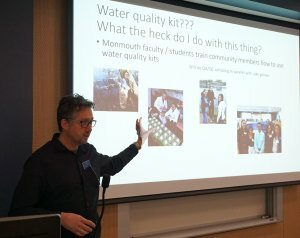 Through the partnership, Urban Coast Institute (UCI) and School of Science staff and students will train community members to collect water quality samples and post their results to an online database, helping build a better understanding of the conditions in each lake. The UCI is managing the two-year effort with the support of a grant from the Jules L. Plangere, Jr. Family Foundation. The funding supported the purchase of water quality sampling kits that will be supplied to participants from each of the communities. Endowed Associate Professor of Marine Science Jason Adolf will work with a team of students to analyze and ground truth the data. CLONet will establish a system for what types of data will be collected (for example, temperature, salinity, pH), where and how frequently sampling will take place. According to School of Science Assistant Dean John Tiedemann, CLONet’s roots trace back to another coastal lakes meeting that was convened at Monmouth a decade ago. At the time, there was a consensus that the county’s coastal lakes suffered from a common set of problems, but there was a vacuum in terms of any central agencies responsible for addressing them. Tiedemann noted there were discussions about launching an initiative like CLONet in 2010, but Superstorm Sandy knocked the momentum off track and prompted the communities to re-evaluate their lakes’ needs. The latest Coastal Lakes Summit was the third event of its kind held at Monmouth since 2008. Monmouth County’s coastal lakes have historically been important resources for their communities, first as drinking water sources for early settlers, and later as focal points for tourism and recreation, Princeton Hydro President Stephen Souza said. Those that connect to the ocean are also critical spawning grounds for anadromous fish. However, these ecosystems have been degraded due to pollution, algae blooms and invasive species. Many of the lakes are plagued by a process called eutrophication. According to Souza, the problem occurs when there are blooms of cyanobacteria (also known as blue-green algae), a biologically adept organism that thrives on nitrogen from the atmosphere and organic phosphorous compounds carried into the water by runoff. Cyanobacteria can block sunlight needed by other plant life but don’t mind low-light conditions themselves. 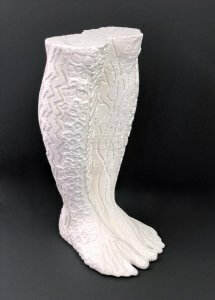 They are rejected as food by filter feeders and zooplankton, he said. Heavy rain events can flood the waters with nutrients for these cyanobacteria, causing a sudden explosion in their populations. The organisms have been known to quickly sap out all of the oxygen in the water, causing fish and other organisms to die off. Common nutrient sources include lawn fertilizers, septic leaks and waterfowl feces. The good news is, a eutrophic lake is not a dead lake, Souza said. Measures such as bolstering vegetation along waterlines and reducing and pre-treating runoff can “put lakes on a diet” and nurse them back to better health, he said. Participants held a series of breakout discussions focused on the specific needs and issues facing their respective lakes, as well as next steps. Community workshops will be held in the lake areas under the guidance of Monmouth faculty, staff and students to mentor each community group on sampling techniques, and further discuss restoration plan development and implementation. For more information, email UCI Associate Director Tom Herrington, CLONet project manager, at clonet@monmouth.edu. Presentations and materials from the Coastal Lakes Summit are available below. Monmouth University Associate Professor Deanna Shoemaker and her communication students are collaborating with community leaders and residents to generate and record oral histories of longtime Asbury Park residents and youth as part of a service learning and community engagement (SLCE) project. The results of this ongoing project will eventually be shared with members of the coastal community in various ways. With the support of an Urban Coast Institute grant, Shoemaker and her students have partnered with the local nonprofit KYDS (Konscious Youth Development and Service) in Asbury Park. This organization was founded in 2014 by Mychal Mills and Rodney Salomon, both Monmouth alumni, and their mission is to prepare and create future leaders through holistic interventions and mindful youth development. 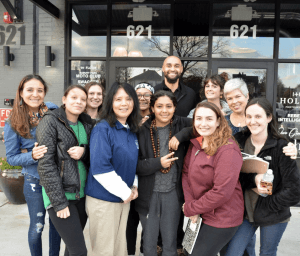 Graduate students in Shoemaker’s fall 2018 “Communication, Culture, and Community” class attended KYDS’ community events (gentle yoga, meditation, and open mics), met with various community leaders to learn about the history of Asbury Park, and co-hosted creative expression workshops with KYDS youth members at MU’s Lakehouse Music space in Asbury Park. Students also conducted research that helped prepare them to interview members of KYDS on topics such as gentrification, displacement, and positive youth development. Since Asbury Park’s genesis as a beach tourism resort in the late 1800s, its east side has historically been the wealthier of the two areas, with hospitality businesses that were once exclusively geared toward white customers and off-limits to the black patrons who lived in neighborhoods west of the railroad tracks. Tensions caused by these disparities contributed to a 1970 riot that resulted in the destruction of buildings and a near abandonment of the waterfront district. The city is now in the midst of an economic resurgence that has brought about an overall rise in property values but also gentrification issues, as the progress has made the city less affordable for longtime residents. For her graduate students in communication who study community-based research methods and undergraduate students in performance and communication-based courses who study and present cultural stories from their own and others’ lives, Shoemaker hopes that service learning teaching and learning methods offer more applied experiences of the value of civic engagement and social justice. Listening to and helping to document stories from longtime local residents may contribute to deeper understanding and unity within our diverse and dynamic communities. “Service learning projects can offer students meaningful opportunities to interrogate their own assumptions, build rapport and trust, practice empathic listening, and mutually discover ethical and sustainable ways to partner with fellow community members and organizations to collaboratively address community challenges,” Shoemaker said. The longer term goals of this project are to identify and interpret key themes in residents’ narratives, support residents in developing initiatives that help to address various challenges, and encourage greater community trust and honest discourse. The results of this multi-year service learning project will be shared through video, audio podcasting, public performances, and various forms of publication. Randall S. Abate, professor in the Department of Political Science and Sociology and Rechnitz Family/Urban Coast Institute Endowed Chair in Marine and Environmental Law and Policy, delivered two presentations in Washington, D.C. last week. 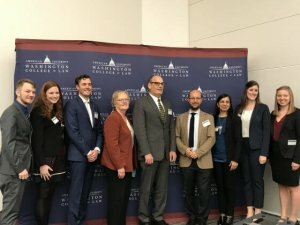 On Feb. 14, Abate delivered a book talk on his work-in-progress book, “Climate Change and the Voiceless: Protecting Future Generations, Wildlife, and Natural Resources” (Cambridge University Press, forthcoming August 2019), to approximately 30 law professors, attorneys, and law students at George Washington University Law School. The following day, Abate (seen in center of photo) delivered a presentation on a panel addressing climate change displacement and migration at a symposium entitled “The Legal Effects of Environmental Destruction on Human Rights and Global Migration” held at American University Washington College of Law. Joining Abate on the panel were experts on climate change displacement and its impacts on global security from the World Bank, the United Nations World Food Programme, Human Rights Watch, and Georgetown Law School. 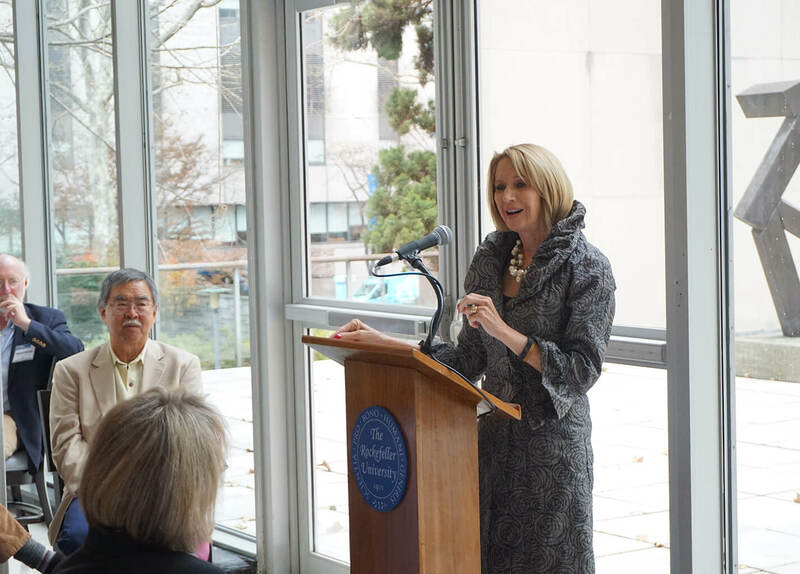 Approximately 120 law professors, attorneys, law students, and members of the public attended the event. The UCI has awarded grants for five faculty and student research efforts at Monmouth University in the spring semester and is now accepting applications for summer and fall opportunities. Funding is provided through UCI Scholars Program, which offers competitive grant opportunities to students and faculty of all disciplines whose work would advance core elements of Monmouth’s Strategic Plan and support the UCI’s mission. In total, three Faculty Enrichment Grants and two Mini-Grants were approved for spring applicants representing six departments within the University. Videos, graphics and other content will be developed for an educational story map geared toward elementary school students that explores the differences and similarities in coastal cultures around the world. Callas will continue to build on her nature-inspired Discovering the Ecological Self project through an arts residency at Spain’s Joya: arte + ecología. Funding will support the development of an interdisciplinary curriculum module focused on the study of fractal patterns in nature, including in coastal environments. Tools and supplies will be purchased for students creating calligraphy art focused on phrases that reflect environmental and societal challenges in coastal regions. Humphrey will lead a panel discussion that explores how the sea unites and divides Caribbean cultures in literature. Monmouth University students and faculty of all disciplines are invited to apply now for summer and fall UCI Scholars funding opportunities. Student-Faculty Collaborative Summer Research Grants for research projects either proposed by students with the support of a faculty mentor or proposed by a faculty member to enable students to conduct research with them. Proposals are due March 15. Heidi Lynn Sculthorpe Summer Research Grants to support student research projects in natural and social science, humanities, economic and public policy research involving faculty and students from any School or Department at Monmouth University. Proposals are due March 15. Faculty Enrichment Grants for the enhancement of existing curriculum, new curriculum development, research and scholarship, and team-teaching opportunities. Deadlines are April 30 for the summer semester and June 30 for the fall semester. Mini-Grants are also available to faculty and students for conference fees, symposia, guest speaker honoraria, equipment and supplies, and other needs to be determined on a case-by-case-basis. Applications can be submitted at any time and are reviewed on a rolling basis. Awards range from $250 to $500 depending on the availability of funds. Those interested may apply via the UCI Funding Opportunities page on the MyMU Portal (Monmouth University sign-in credentials required). For more information, contact UCI Associate Director Dr. Thomas Herrington at (732) 261-5588 or therring@monmouth.edu. The “new normal” of increased storm events, flooding, sea level rise, and coastal erosion from climate change presents daunting adaptation challenges for New Jersey in the years ahead. This symposium features leading experts in climate change adaptation law and science to discuss lessons learned from other states and countries to assist New Jersey in navigating these challenges. Strategies to combat climate change-induced and other anthropogenic factors in eutrophication of coastal marine ecosystems, and the impacts to ecosystem services and the communities who depend on them. For more information, contact Randall S. Abate at rabate@monmouth.edu. 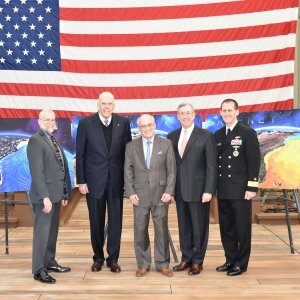 Monmouth University President Emeritus and UCI Ocean Policy Fellow Paul G. Gaffney II was a member of the first class of three inductees to the Naval Meteorology and Oceanography Hall of Fame during a Jan. 25 ceremony at the John C. Stennis Space Center in Mississippi. Vice Adm. (ret.) Gaffney served as commander of the Naval Meteorology and Oceanography Command (NMOC) from 1994 to 1997. He became the first naval oceanographer to attain the rank of vice admiral. Gaffney is credited with attaining the visionary goal of making Naval Oceanography a world-class supercomputing facility and delivering three oceanographic survey ships into the operational fleet—USNS Pathfinder, USNS Sumner and USNS Bowditch. Read the full story in Monmouth Now. Professor Randall S. Abate (Rechnitz Family/UCI Endowed Chair in Marine and Environmental Law and Policy) discussed his upcoming book “Climate Change and the Voiceless: Protecting Future Generations, Wildlife, and Natural Resources” on the Healthy Planet public radio show. Listen to the discussion. Monmouth University Assistant Professor of Art and Design Kimberly Callas will build on her nature-inspired Discovering the Ecological Self project abroad, having accepted an arts residency at Spain’s Joya: arte + ecología. 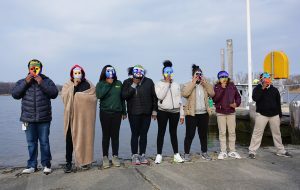 Launched last year with grant support from the UCI, Discovering the Ecological Self provides at-risk youth an opportunity to learn about the coastal environment and science through an artistic lens, under the direction of Monmouth student mentors. Middle school age students take field visits and classroom lessons focused on nature-based topics, explore them from philosophical and cultural perspectives, and create works of art inspired by them. 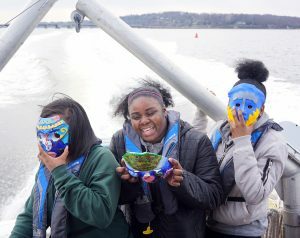 Last spring, UCI staff gave the students a tour of the Navesink River while they wore colorful 3-D printed masks patterned after marine life. While in Spain for the weeklong residency in March, Callas will make drawings and etchings of nature-based symbols in the landscape that represent the region’s culture and identity. 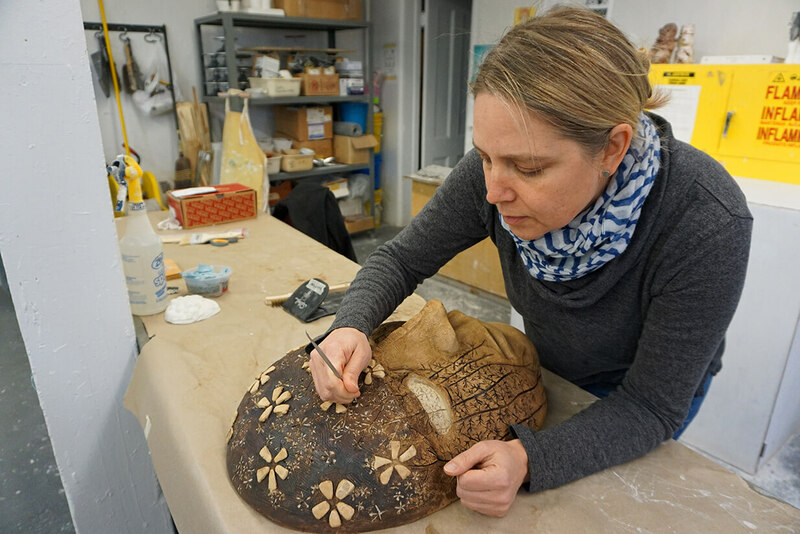 The symbols will then become tactile patterns along the skin of a life-size, 3-D printed figure that she will create in her studio at Monmouth. Joya will offer no shortage of inspiration. The scenic property in Andalusia’s rural, arid mountains was a working farm that was abandoned by its owners in the 1960s due to the country’s continued post-Civil War economic stagnation and repression by the Franco regime. Since Joya’s launch in 2009, artists have contributed to the buildings’ rehabilitation and redesign, as well as the rejuvenation of the land. The facility is now a model of sustainability, with power supplied almost entirely by renewables and two systems that recycle all of its waste water to nourish the property’s plants. That is a source of special interest to Callas, who in 2006 co-founded a sustainability institute in Maine called Newforest. She and her husband, an energy auditor by trade, still maintain an in-ground stone home in Maine that has a sod roof, solar array, wood heating, and other eco-friendly features. This semester, the Discovering the Ecological Self project will resume with a focus on trees. UCI funding supported student work to create Discoverecoself.org, a website that contains image galleries of the artwork, a blog chronicling group activities and other details about the project. For more information, visit the website or watch this video created last year by student Joy Morgan. Advanced technologies capable of analyzing DNA in seawater will help answer some of humanity’s oldest, most profound questions and concerns, including “who lives in the sea?” – beginning with species of interest in specific areas, including clownfish (Nemo) and blue tang fish (Dory). 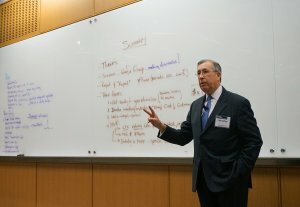 To accelerate the pace towards the potentially far-reaching benefits of these technologies — both environmental and economic — organizers of the National Conference on Marine Environmental DNA (eDNA), co-organized by Rockefeller and Monmouth Universities in New York, prescribed priority steps for government, researchers, industry and investors. Download the final report from the event or view a news release summarizing its findings. Register Now: Mid-Atlantic Ocean Forum March 20 at Monmouth U. March 20, 2019 | 8:30 a.m.-5 p.m. The Mid-Atlantic Committee on the Ocean (MACO) will convene a Mid-Atlantic Ocean Forum on March 20 to discuss issues including the Mid-Atlantic Ocean Data Portal, offshore wind energy, maritime commerce and navigation, non-consumptive ocean recreation, marine debris. MACO was recently established by the Mid-Atlantic Regional Council on the Ocean to foster collaboration among states, federal agencies, the Mid-Atlantic Fishery Management Council and federally recognized tribes. The purpose of MACO is to enhance the vitality of the region’s ocean ecosystem and economy through increased communication and collaboration. The forum is open to the public and welcomes your participation. View the agenda and register online. For more information, contact Judy Tucker at info@midatlanticocean.org. 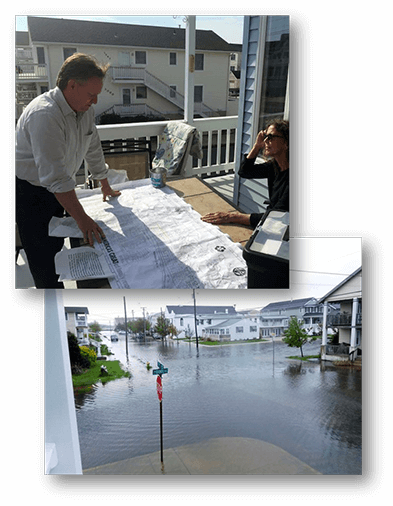 UCI Associate Director Tom Herrington shared his experience working with community members to find solutions for chronic nuisance flooding in Ocean City, New Jersey, at the American Geophysical Union’s (AGU) Fall Meeting. Held Dec. 10-14 in Washington, DC, the event assembled thousands of researchers dedicated to physical sciences spanning from the bottom of the oceans to deep space. Why do dead fish float? Does the Navesink River have a pollution problem? And what’s that smell coming off the water with the breeze? 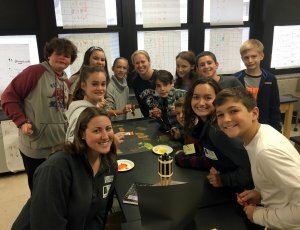 Rumson seventh graders came up with a long list of questions during a recent field trip to the Navesink, but Dr. Jason Adolf’s Principles of Marine Biology (BY 341) students had the answers. 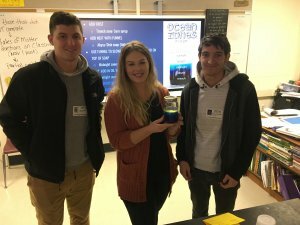 The Monmouth University juniors and seniors delivered lessons to six of science teacher Jenn Crow’s seventh grade classes at the Forrestdale School on Nov. 27. Adolf, an endowed associate professor of marine science, said part of his course assignment was for his students to answer as many of the questions as possible while giving presentations on topics they’re studying at Monmouth. They included discussions on the impacts of plastics in marine environments, bioluminescence, biofluorescence, marine food chains and more. The Monmouth students came up with some hands-on exercises to make the lessons engaging for the young scientists. In a lesson on stratification in the ocean, students mimicked the layering that naturally occurs by filling jars with household liquids like vegetable oils, honey and water. The Monmouth University School of Science and Urban Coast Institute have partnered with Rumson on several educational initiatives, most notably a joint plan to develop the Monmouth Marine and Environmental Field Station on municipal property along the Navesink River. Monmouth faculty and students are also working with the borough to transform a pond on the Forrestdale property into an outdoor educational space. 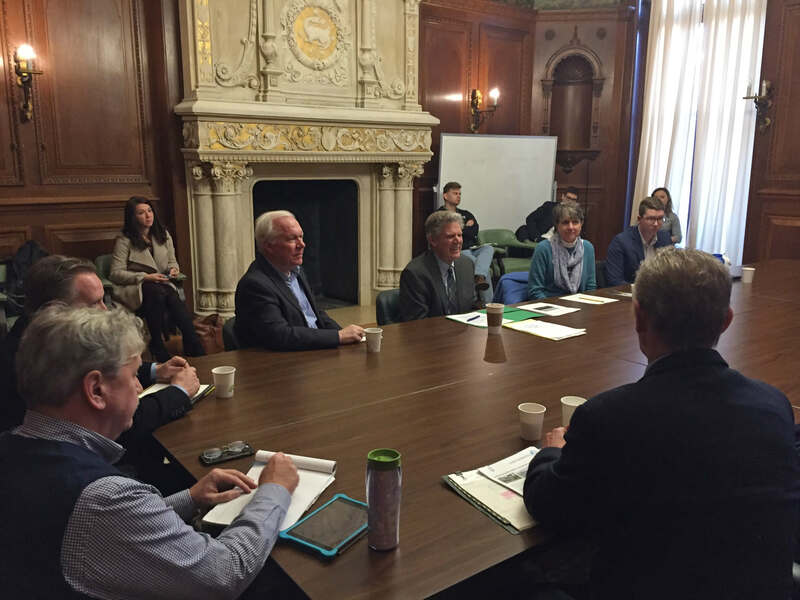 Congressman Frank Pallone met with the UCI and other New Jersey environmental leaders at Monmouth University Dec. 18 to discuss the urgent need to address climate change. View an NJTV News segment about the meeting. 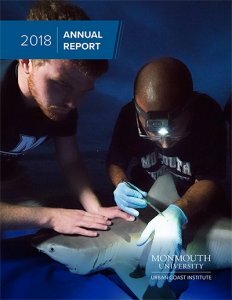 Monmouth University staff and students gathered with 100 of the nation’s leading practitioners of environmental DNA (eDNA) science on Nov. 29 and 30 to share discoveries, state-of-the-art technologies and new methods for this groundbreaking marine life detection method. 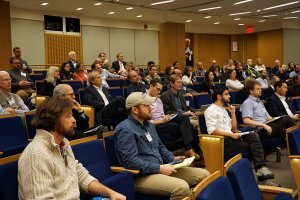 The National Conference on Marine Environmental DNA was the third in a series of four conferences (The Marine Science & Policy Series) being organized jointly by the Urban Coast Institute (UCI) and The Rockefeller University Program for the Human Environment (PHE). The events are held annually on rotating campuses, with the 2016 National Ocean Exploration Forum at Rockefeller University in New York City, the 2017 Mid-Atlantic Blue Ocean Economy symposium at Monmouth University, and the latest event back in Manhattan. 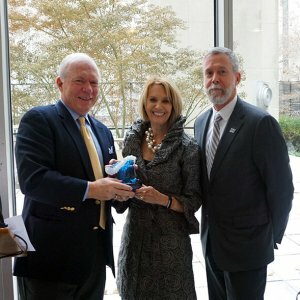 The conference was capped by a luncheon honoring National Academy of Sciences President Marcia McNutt with the UCI’s Champion of the Ocean Award. Sampling for eDNA is an approach that allows scientists to confirm the presence of fish and other organisms by testing for trace amounts of genetic material that they shed into the water. The technique holds the promise of being less expensive, more humane and more revealing than other longstanding scientific methods that rely on physically catching or observing animals. Monmouth has piloted research in local waters such as Wreck Pond, Sandy Hook Bay, Deal Lake and the Navesink and Shrewsbury rivers. The conference highlighted insights provided by eDNA to date and its potential to further scientific knowledge and inform ocean management. One of the innovations discussed was “Go Fish,” an eDNA testing tool developed by PHE Senior Research Associate Mark Stoeckle that can confirm the presence of a given species inexpensively and within a few days. He noted that rapid access to eDNA data could be used to aid authorities with time-sensitive decisions. One such example was provided by McNutt, who described how eDNA is being used to monitor the threat of invasive Asian carp entering the Great Lakes. Researchers are employing eDNA tests as an early warning system to detect whether the fish have made it past barriers set up in the lakes’ tributaries to thwart their advance. A goal of the conference was to initiate a commitment by leading scientists and stakeholders to take up eDNA as a cooperative national or regional research theme. UCI Director Tony MacDonald credited PHE Director Jesse Ausubel for his vision in recognizing eDNA’s potential to solve problems and raising its profile throughout the scientific community. 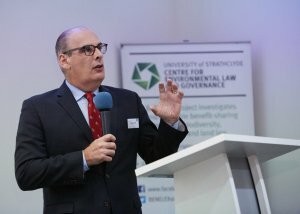 Professor Randall S. Abate (Department of Political Science and Sociology and Rechnitz Family/UCI Endowed Chair in Marine and Environmental Law and Policy) traveled to the U.K. from Nov. 28-Dec. 6 to deliver invited presentations at three universities. First, he discussed his forthcoming book, Climate Change and the Voiceless: Protecting Future Generations, Wildlife, and Natural Resources (Cambridge University Press, forthcoming August 2019), with professors and graduate students at the University of Cambridge on Nov. 29. 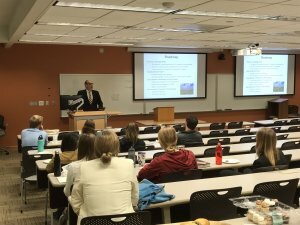 The book talk was hosted as the final lecture of the semester in the Cambridge Centre for Environment, Energy and Natural Resource Governance Thursday Seminar Series. The series featured distinguished speakers from the University of Cambridge and universities in the Netherlands, Spain, Chile, and India. Professor Abate was one of only two invited speakers from the US in this series. 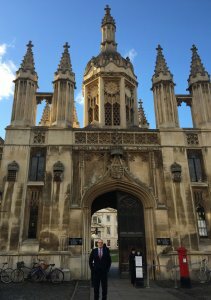 Professor Abate then traveled to London to deliver a second talk on his Climate Change and the Voiceless book to professors, graduate students, and lawyers at King’s College on Nov. 30. The event was hosted by the King’s College Climate Law and Governance Reading Group. He concluded his U.K. tour with a stop in Glasgow, Scotland, for two presentations at the University of Strathclyde. They included a third talk on Climate Change and the Voiceless Dec. 4 and a presentation titled, “Ocean Iron Fertilization and Indigenous Peoples’ Right to Food: Leveraging International and Domestic Law Protections to Enhance Access to Salmon in the Pacific Northwest,” to approximately 75 professors, graduate students, and lawyers at a conference on Dec. 5. 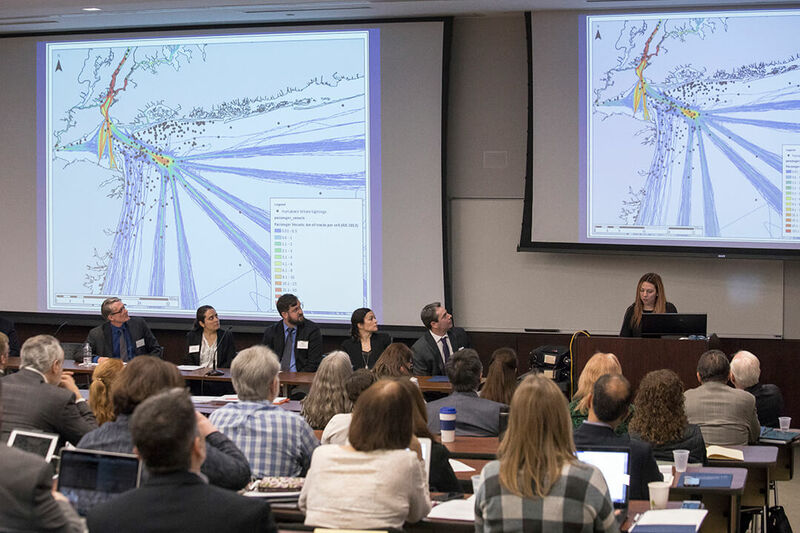 The conference, “A Vision for Ocean Law Governance: 2020-2030 and Beyond,” featured experts on ocean governance topics from the U.K., Canada, the Caribbean, and the South Pacific. Professor Abate was the only invited speaker from the US.